Fine Art Photographic Canvas Prints, come signed by the photographer. Photographs are printed to the highest quality on 315gsm high quality Canvas, and are available in two sizes. In 1511, the ossuary was created by a half-blind monk who gathered up the bones of the black death victims, which were added to with victims from 15th century Hussite Wars. In 1870 a wood carver was employed by Schwarzenberg family to fasion the bones into works of art. The dominating chandelier that hangs from the ceiling and forms a pivotal focal point from wherever you are within the church. 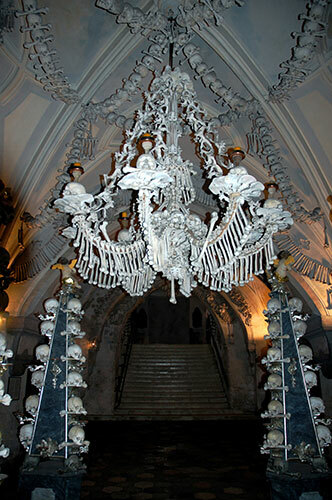 Every bone from the human body was used in the construction of the chandelier, composed from several bodies. We deliver worldwide. All orders are secure, and we have no access to your private financial information, only your contact details which will be used for dispatch purposes only. Please note the currency converter at the top of the page is for approximation purposes only. We can accept credit card payment worldwide. Alternatively, we can also accept direct bank transfers in pound sterling or euros only (to avoid additional fees). If wishing to pay by bank transfer, please click 'buy' and follow the check-out process and select the relevant payment method. Your contact and order details will be emailed to us, and we will contact you with an invoice providing the necessary payment information to complete your transaction.